Victor Vance taking over an empire. Empire Building is one of the new features added to the Grand Theft Auto series in Grand Theft Auto: Vice City Stories. This feature is inspired from a mix of the properties from Grand Theft Auto: Vice City and gang territories in Grand Theft Auto: San Andreas. In Vice City circa 1984, Vice City was a growing city. Economic opportunities were available to anyone who could afford them. Victor Vance, after killing Marty Jay Williams in "To Victor, the Spoils", gains access to these sites. Since his organization, the Vance Crime Family, was a criminal organization, these sites were used as bases of operations for his various activities. Each site was disguised as a front business. There are three levels that each business can go through: Small-time, Medium Venture and High Roller - the larger the business, the larger the profit. The daily income is paid every day at 16:00 (4 PM). The empire sites come under constant attack from rival gangs, because to gain new sites, the player must seize them from other gangs and they try the same in return. If the rival gang succeeds in damaging the site, its daily income will drop--or rarely, it could even be seized by the other gang. These sites, when entered, have members of Vic's gang inside. Some, when spoken to, start missions. These missions are based around the operation's business, i.e. Smuggling businesses yield smuggling missions. Upon creating a High Roller empire site for a business, Vic unlocks a new clothing item, again, something related to the business that unlocked that particular item. Each business also has a vehicle that is either not found anywhere other than that particular business, or a vehicle with increased statistics. Once all 30 empire sites are taken over by the player, the vehicles that spawn outside of them will become bulletproof. To make profit throughout the game, conquering enemy businesses is necessary to progress. The player must first destroy the rival's car/bike parked outside the building. Next, gang members will come out to defend their turf. Once defeated, the player must eliminate the remaining members and destroy business assets inside the building. But be careful after attacking and seizing an enemy business the gang that previously owned it will send deathsquads after you making it hard to get to the next one you want to attack. The Cholos will send two members in a Cholo Sabre armed with Baseball Bats, Micro SMGs, and Pistols. The Bikers will send two members on a bike armed with Micro SMGs and Scorpions. The Sharks are the deadliest. They send four members in a Gang Rancher armed with MAC-10s, MP5s, Micro SMGs, and AK-47s. Once that is completed, the business is put up for sale, and can be turned into any business type wanted. 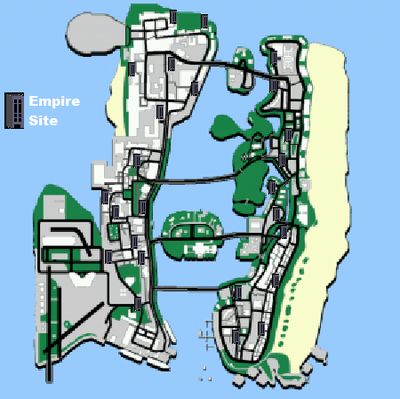 The empire site locations around Vice City. This page was last modified on 21 December 2012, at 16:52.